Just One Hour of Running Could Add 7 Hours to Your Life - Something New Everyday! Your Ultimate Guide to Starting a Running Routine! Want to live a long life? According to a new study, runners tend to live about three years longer, even if they smoke, drink and are overweight. The results found that five minutes of running every day could extend their life span. The estimation that running adds more time to people's lives than it takes up was perhaps the most interesting result of the study, which discovered that an hour of running equates to seven hours added on to your life. Nevertheless, these additions "are not infinite", according to the study co-author, Dr Duck-chul Lee. "The added years to longevity are capped at around three extra years," he said. Other kinds of exercise also help with lengthening life spans, but not to the same degree as running. According to Dr Duck-chul Lee, walking and cycling typically lessen the risk of premature death by 12 percent. According to Dr Lee, 'it's unfounded why running has such a substantial relationship to lifespan." Adding that, one benefit may be the lowering of high blood pressure and its ability to get rid of extra body fat. So, if the aforementioned study has convinced you to get a head start on your running routine, here are a couple of tips to bear in mind. 1. Start with a walking/cycling routine first: Even if you may be eager to start running, you'll run longer, feel stronger and stay injury free if your start by adding short bouts of running to your regular walks, increasing the amount of time that you spend running. During your routine, add one minute of running for every four minutes of walking, gradually increasing your running time. Once you've built your stamina, aim to run for twice the amount of time that you spend walking. 2. Stay injury free: Going too far, too fast, before the body is ready is one of the most common causes of injury - potentially causing shin splints, IT band syndrome and runner's knee which will put your running routine on hold. As mentioned above, gradually build the time your spend walking and running, increasing the time by no more than 10 percent from week to week. 3. Listen to your body: Muscle aches and soreness, particularly in the quadriceps and calves are to be expected from time to time. But there are some pains that you shouldn't ignore, particularly sharp pains, or pains that persist or worsen as you walk, run or go about your daily activities. These types of injuries signal that you need to rest for at least three days and see a doctor if needed. 4. 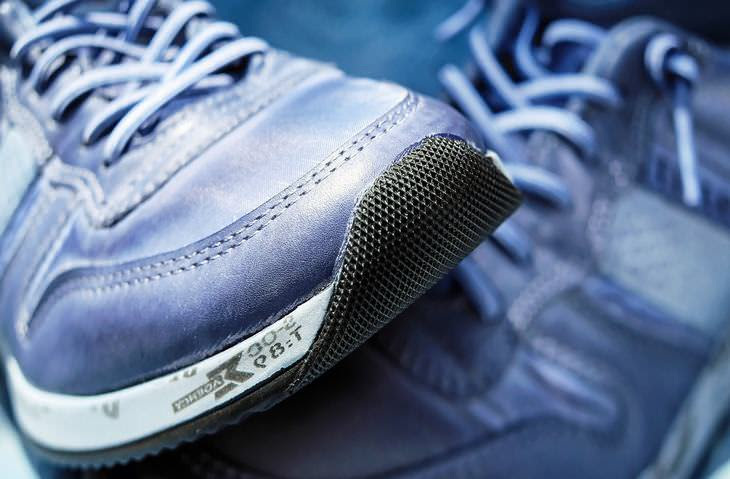 Get a good pair of shoes: While you don't need any fancy equipment to start running, a new pair of shoes are not negotiable as worn-out shoes can cause injury. Your shoes should be replaced every 300 to 500 miles. You should also opt for clothes made of technical fibers that wick away moisture from the skin. 5. Choose your route: Be it on the treadmill, the road, in the woods or the trail, the most important thing when you start running is to find a safe route that feels comfortable. Treadmills offer a cushioned alternative to a pavement and will allow you to get your running routine in despite the weather conditions. If you're new to running and treadmills are not an option, opt for a track as they are flat, traffic free . Most tracks are around 400 meters. Four laps are equivalent to one mile. 6. Train your brain: Getting out of the door will be your hardest challenge. More often than not, relying on willpower alone won't work so make a plan. Plan to listen to certain types of music, pick the most convenient time to work out and pick some rewards that will entice you further. Put your workout clothes next to your bed and prepare your workout music the night before. Then be sure to treat yourself to something you'll genuinely enjoy like a hot shower or a smoothie, allowing your brain to associate exercise with an immediate reward. 7. Be patient: Many positive changes do not happen overnight. The weight loss comes when you are consistent, but it takes time to condition your muscles, ligaments and tendons. The body needs time to adjust. Did you know that with every step you take, it stimulates bone growth, enabling your bones to get stronger and denser? But if you are not patient, you risk doing too much too soon and the chances of injury are higher.